Roger Joseph Ebert's Email ID answerman@gmail.com hacked by Rapt0r for Anonymous Operation #AntiSec. Roger Joseph Ebert is an American film critic and screenwriter. He is the first film critic to win a Pulitzer Prize for Criticism. 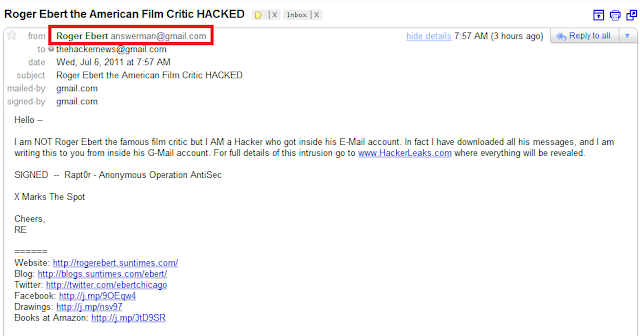 Hacker Get access to his email ID and Email us (The Hacker News) from his ID with a message as shown "I am NOT Roger Ebert the famous film critic but I AM a Hacker who got inside his E-Mail account. In fact I have downloaded all his messages, and I am writing this to you from inside his G-Mail account. For full details of this intrusion go to www.HackerLeaks.com where everything will be revealed.". Hacker claim to download all his emails and offering to expose all data on www.HackerLeaks.com. We check the given site, but its not working right now. We check the Facebook page of Roger Ebert to verify that is answerman@gmail.com is the real id of Roger. Below in screenshot you can see that his Facebook page also mention the same email ID. 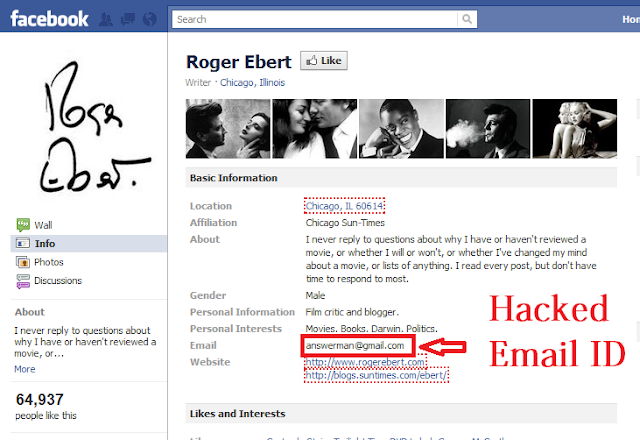 We try to inform Roger Ebert about this hack via a tweet. Hope he will Recover it as soon as possible. Anonymous attacks are increasing day by day. Today also Hackers posts fake celebrity stories on Sony site.Then Anonymous leaks Nimbuzz data for collusion with pro-censorship governments. PayPal UK Twitter account hijacked by angry customer.